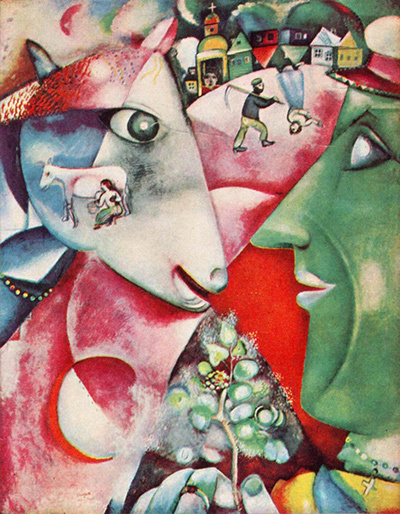 Marc Chagall was a French, and originally Belarussian artist who held incredible creative and technical abilities which allowed him to combine various modern art styles together in many different mediums. 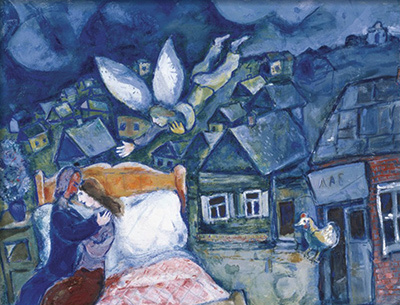 Chagall paintings are the best known from his career, mainly due to the popularity of this medium, but there really is so much else to see that we decided to set up this unofficial website at MarcChagall.co.uk which draws much of his finest work together. Beyond the oil paintings of Chagall, there were also stain-glass windows, prints, posters, illustrations, stage sets, ceramic and tapestries. There is also a Liverpool Tate Exhibition in 2013 which was well received. 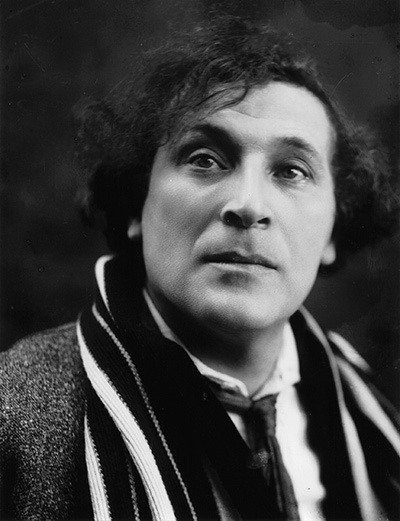 Marc Chagall lived through virtually the whole of the 20th century and this enabled him the time to really use his talents in as many ways as possible, constantly looking to take in new ideas and techniques which kept appearing during this highly innovative artistic period. 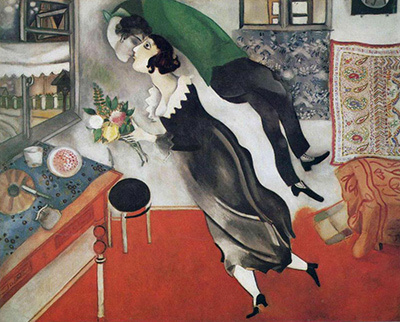 Chagall prints are now amongst the most popular in the world and this website looks to highlight his best works as well as offering you some approved print reproductions from Art.com, with who we are an affiliate. The gallery has carefully selected images of paintings from a huge collection available from their website. Marc Chagall was involved in several art movements, though his work was highly individual and drew many of their traits together to form very much his own characteristic approach which remains much loved today. His use of colour is seen as particularly one of his strengths and his oils were often very bright which suited the changing tastes in European art at the time, thanks to the role played earlier by the impressionists and post-impressionists such as Claude Monet and Vincent van Gogh. You may see similarities between their work and that of Chagall here, as well as other later influences from 20th century modern artists like Franz Marc, Paul Klee and Wassily Kandinsky. Having been born in what is now Belarus, and then moving to France, this was an artist who could immediately count upon different influences upon his life in general and France itself was the right choice for most budding artists at that time. The country had a great passion for art in general and was also responsible for unleashing several significant forward-looking movements around that time, most notably Impressionism. The Tate Liverpool Exhibition in 2013 is likely to bring artist to a new set of fans, who may not have actually been aware of his work previously. The spread of the Tate into new venues around the UK has been with the intention of spreading art knowledge and enjoyment across the country, and the Chagall exhibition will likely help to achieve that. Tickets will be greatily in demand, though, as this artist naturally already has many supporters thanks to his role in many notable art movements, such as surrealism and expressionism as well as his renowned use of colour in an imaginative and explorative way. Marc Chagall paintings were the most prolific used by the artist, with oils suiting his style perfectly. It would be impossible to put all of them into this homepage so have just added around 30 of the best that he produced during his long career. They are spread throughout this page and inspersed with information about the artist's life and career as well as his other artistic creations, such as with fine art prints, ceramics and stain-glass windows which all also deserve attention. 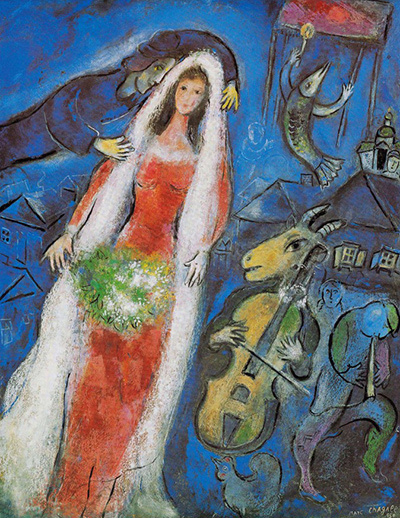 Artist Marc Chagall can be seen to be amongst the top ten or so contemporary artists to have come from the across the whole of Europe, and this quality is reflected in the extreme popularity that continues to surround his work with global exhibitions frequent and always very well attended. Chagall portraits were very common, but went far beyond the usual approches of artists who had gone before. This painter preferred more fantastical atmospheres with his own imagination appended into each art work. 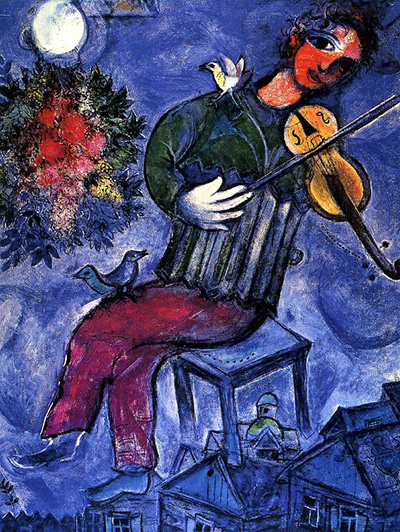 Concert is a typical of the type of work which came from Marc Chagall. It features the dreamy landscape settings for which he is famous, as well as the romantic portraits of people as the main focus. The colours are immediately striking are chosen carefully to lead the eye in the way that the artist intended. There are many more to see like this below, but Concert is a great starting point.